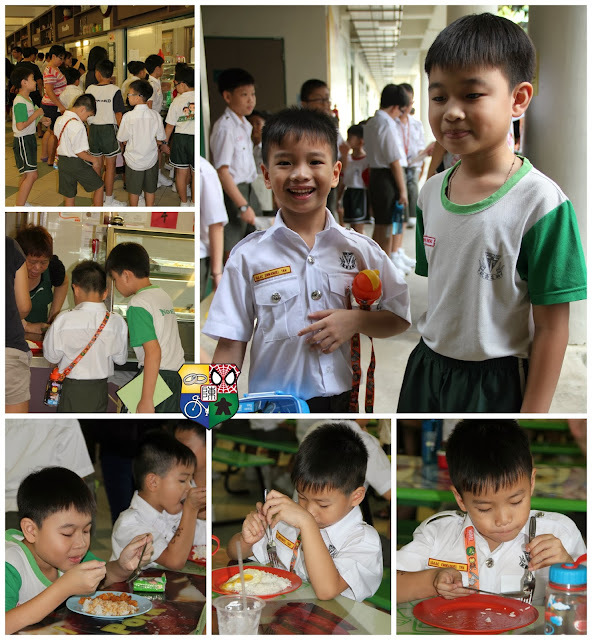 Without boring you any further with my inane fears, let me present to you... Isaac's First 7 Days in Primary School! Isaac needs to wake up at 5am as his school bus comes at 5.35am. He was sufficiently psyched up and excited to go to big boy school so he did not make a fuss waking up on this day. When we went downstairs, we saw a bus uncle and assumed he was our bus uncle. But he took a look at Isaac's uniform and said "No, not my school." and he told us he is fetching a kid at 5.40am to send to a school which is a mere 10 minute drive away! Suddenly, we don't feel so bad about his school bus timing after all! 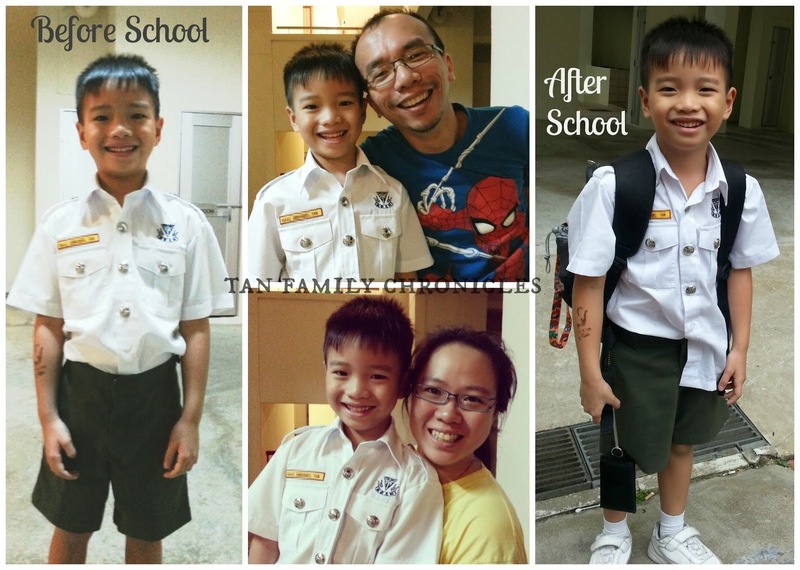 Hubbs managed to apply for Child-Care Leave to accompany Isaac to school, by school bus! 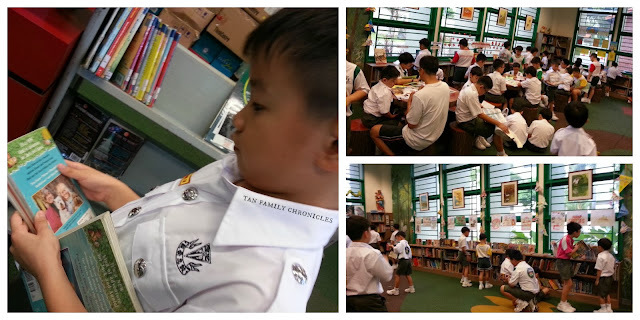 I sent the twins to childcare and went to the school to join hubbs.. Where he was excitedly talking to his primary school friends. Hubbs, not Isaac, talking to his friends. It was quite amazing, I had never seen so many dads at a school function/event thingy before. I left hubbs to his long lost friends and looked out for Isaac as it was recess time. 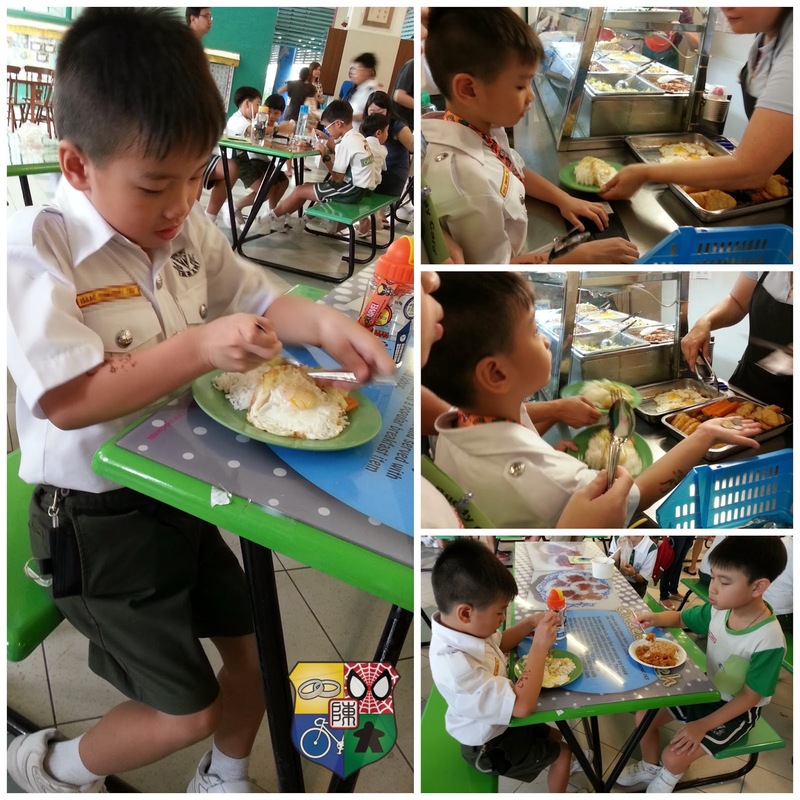 The buddy lined up with Isaac to help him get his food, settled him at a table, before going off to get his own food. Isaac bought white rice and a sunny side up egg, and steadily proceeded to eat up every bit of it. I was actually pleasantly surprised that he would order that. Rice & egg $0.90. After eating, Isaac went back to class and continued reading his Enid Blyton: Five Find-Outers book which I had just managed to start him on, the day before. Lest I get carried away and this post starts to read like a novel, I shall continue writing the rest of this post in a semi-point form kinda way... Pictures mostly taken within the first two day of school. He excitedly took his own plate (his buddy helped him the previous day) and in his haste, his wallet was hanging open from the springy thing on his pants. The P5 buddy looked flummoxed by it and quickly tried to help him close his wallet while Isaac was still moving - walking to the table. Rice, egg, vegetable = $1.30. After that, the P5 buddy brought him to see where the school bookshop was, and then they walked back to Isaac's class. I was following at a distance, and suddenly I saw the P5 buddy look around and said "Where is your mummy?" I quickly walked up and said, "Yes?" "He wants to go Library to borrow books. Do you have his IC number?" I said, yes, and off we went to the library. Isaac excitedly zoomed off to get the books he wanted to borrow. But unfortunately, the P5 boy's info was slightly off, as the Librarian informed me that P1 boys are not allowed to borrow just yet. Their form teacher would bring them in one day together, to issue them library cards, and then they can borrow. Disappointed, but calm (read: no tantrums! ), Isaac went back to class and continued reading his Enid Blyton Five Find-Outers book. Highlight of the Day: "The vegetable I bought with my rice and egg VERY NICE!" Isaac came home on the school bus and when I presented him with a chocolate cream bun instead of the pork floss buns he'd been having after school on his first two days of school - he proceeded to throw a tantrum. He had enjoyed that chocolate cream bun before, so I didn't understand why he was making such a big fuss over it. That is, until I realised that he still had the $2 I gave him in the morning for his recess. Mummy me:"Isaac, how come you still have your $2? Did you eat during recess time?" Me:" HUH?! How come?! No wonder you're so cranky! That's because you're hungry!" Isaac:"You didn't tell me I had to eat EVERYDAY?!" I spluttered. Not quite sure whether to laugh or cry. I chose to laugh... until I had tears in my eyes. Me:"Okay. Isaac, please eat everyday. You have to eat rice, or noodles, or bee hoon, with other things." Me:"How come you didn't eat? Weren't you hungry?" Isaac:"I want to save money to buy Lego." Urrghh. Cursed Lego. It's become something of an obsession lately, this Lego thing. We've been having issues with Lego lately. Me:"I like it that you want to save money, but you have to eat. If you don't eat, we won't give you any money for recess time." Me:"Okay, I tell you what. If you eat during recess like I told you to, every time you save money, I will match you for it. So say if you save 50 cents, I will give you 50 cents, but only if you eat, and be good and do your homework." Isaac's eyes widened, and he quickly nodded and said:"Okay Mummy!!!" Highlight of the Day:" I won the game during P.E. !!!" Our dear friend, got his maiden scolding by teachers on Day 4 of school, because he thought he didn't bring his Homework Diary - when actually it was in his opaque file which he did not open up to search. Mummy Me:"It was right here, Isaac. You DID bring your Homework Diary to school." Isaac:"Why didn't you tell me that you put it there?!" Me:"I didn't put it there." Isaac:"I will ask Papa tonight if he put it there." Me:"It doesn't matter who placed it there. What you should learn from this is that you should be the one to pack your own bag next time, so that you know where everything is, and take responsibility if you forget anything." I was trying hard to control myself to not show him that I found it amusing that he had gotten his first scolding so quickly. I was actually laughing and quite glad that he got to learn this lesson early, with such a trivial matter too (better than having to learn his lesson via a serious issue with greater consequences). But he looked so miserable, so I tried to be sympathetic. Me:"So Ms Goh scolded you? Did anyone else forget to bring?" Isaac:"Yes, got others never bring also. We all got scolding, but she scold me the fiercest." Me:"She scolded you most fiercely? How come?" Isaac:"I don't know. She scold me until I cry." Again, I stifled a laugh and hid my grin. Isaac tends to be a little sensitive about such matters, and he's got an incredibly "thin skin" so to speak. So I wasn't too bothered that he got "scolded until I cry" - for in all likelihood, the teacher was just being stern. Besides, I could contact the form teacher anytime as I had her mobile number and email address. And the Chinese teacher's too. In fact, on Day 4, I whatsapped the Chinese teacher to ask if she had issued the ting1 xie1 (Chinese spelling) list yet, because the previous day's Homework Diary indicated that there would be tingxie (Chinese spelling) every Thursday! Thankfully, she said that there'd be no tingxie this week and that they would issue the list the next day. Highlight of the Day:" I got chosen to be the P.E. Monitor!!!" Grabbing every free moment to continue reading the exciting adventures of the Five Find-Outers. Am chuffed that he likes one of my favourite series of books! :) Hope the twins would be voracious readers too! Mummy Me:"Hi darling, how was your day? Did you get scolding today?" Isaac:"No scolding! Ms Goh say "Wah, good! You brought your Homework Diary today!" And everyone laughed, because she was so funny you know. So everyone laughed. hahahahaha..."
Me:"That's great. So did you eat the same thing again today? your rice, egg and vege?" Isaac:"Yes, I did. But I saw one of my friends eat spaghetti. Maybe I will try that tomorrow." Me:"Yes, you can try that, see if it is nice." On Day 5, I whatsapped his form teacher because there was a Health Service form thingy which I was supposed to hand in, but it wasn't in his bag nor at home. Missing in action! She said she'd check his school locker for it. Highlight of the Day:"Actually, everyday I like recess time..."
On Day 6, I emailed his math teacher to inform her that Isaac had already brought the Math Plus 1B on the day after he forgot his homework diary - I had placed it in the bag myself! I wasn't sure if Isaac is plain blur, or just a little unlucky at misplacing items. In any case, it struck me how, within the first 6 days of school, I had already communicated with Isaac's three main teachers. I wonder if this is the norm nowadays. This certainly didn't happen when I was in Primary 1. Highlight of the Day:"We had music lesson today! And we learned to sing Majulah Singapura! School song, tomorrow!" 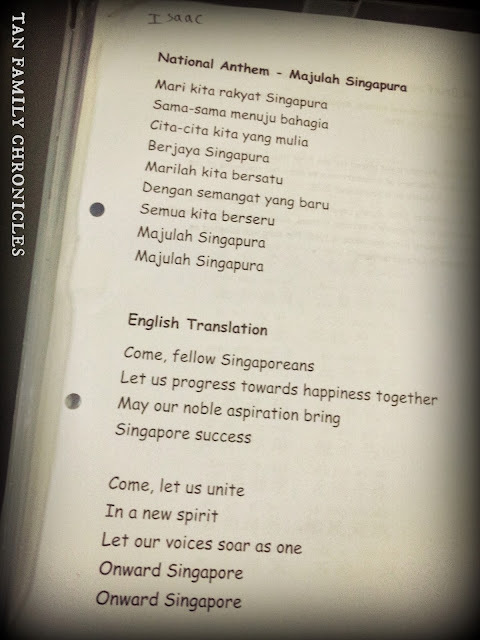 Singapore's national anthem Majulah Singapura, and its English translation. His Maths teacher called me, and said she really couldn't find the Maths Plus 1B we said we brought. Was also whatsapping the form teacher, who said that his health service forms were no where to be found at all. It was clear that I had to make a trip down to the school on Monday to do the necessary. This is the day he came home with some real homework too. The first homework came on Wednesday, but it was just a few pages of math which he finished very quickly. Today, his homework was another 3 pages of maths, and a journal entry titled:"My December Holidays". Gosh, sounds like he is to do a mini-composition already. And he got his list of tingxie Chinese Spelling words. Goodness. I feel my blood pressure rising already. I left him in the living room for 10 minutes on his own and came out to see him napping on the couch. We have been preventing him from napping in the afternoons when he comes home from school as we have been trying to push his bedtime earlier. It has been quite a struggle to do so and Isaac has been having a hard time adjusting his body to the "new time zone". Thus, for the first time in the entire week, I let him take a nap. Sounds really exciting! Must be so, especially for him!